General Desc: A loosely ascending to horizontally spreading plant with a deep root and 1 to several sparingly branched stems. 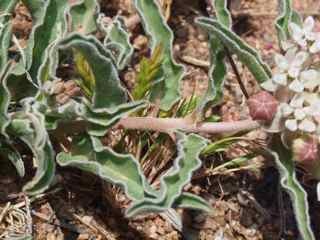 Stems are 2 to 4 inches long. 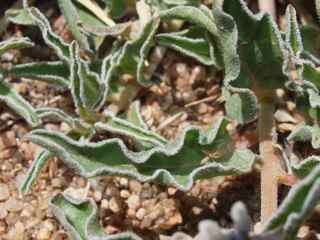 Plants have a milky white sap. 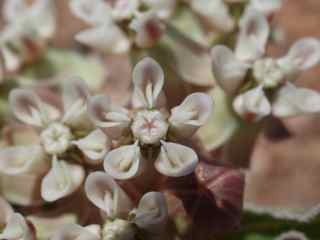 Identification notes: Vegetative parts have short curly hairs; leaves erect, sub-opposite to irregularly alternate, oblong, wrinkled on margins; head-like flower clusters, mostly more than 10 flowered, 5 green to purplish petals, white to yellow horn-like appendages. 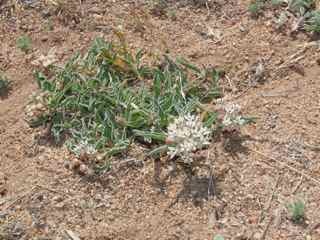 Habitat Description: Sandy desert scrub, chaparral, grasslands, dry plains, mesas, and oak-pine woodlands, on flats and in arroyos. 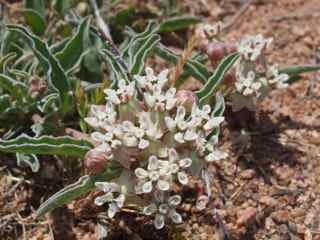 Description: Greenish-white large showy clusters of flowers subtended by 1 to 4 bracts. 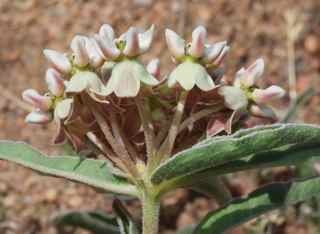 The 5-parted flowers include sepals, petals, a crown (corona) arising from the middle of the petals, upright white to yellow hoods that look like petals and horns. Seed Notes: Fluffy silky tufts of hairs are attached to the round flat seeds.